Based on the Saturday Evening Post serial Aloha Means Goodbye by Robert Carson. During this review I will make countless references to The Maltese Falcon. It can’t be helped as this film was made with the same director, John Huston, and cast; trying to recapture some of the magic of Falcon. 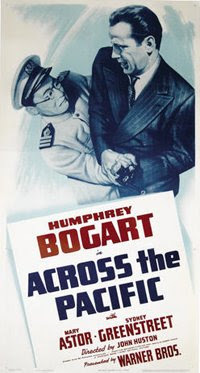 Needless to say, Across The Pacific doesn’t quite measure up to it’s esteemed predecessor, but it is till an incredibly enjoyable spy adventure. The weaknesses in the film are not a reflection on Huston’s direction or the acting performances, but a limp script that was being chopped and changed to suit the political machinations at the time. Even the title Across The Pacific stems from earlier drafts of the script – the characters don’t even get close to crossing the Pacific. As America entered WW2, what started out as an adventure film became a propaganda piece. Before the film was even finished, Huston went off to join the war effort and the final scenes were directed by Vincent Sherman. Humphrey Bogart plays Rick Leland an American soldier who is court-martialed and kicked out of the service. Disgraced, he tries to join the Canadian Army but they don’t want him either. Feeling rejected by his country, Leland sells his skills as a soldier of fortune, and accepts a job in Latin America. To get there, he boards a Japanese steamer heading south. On board are an unusual collection of characters. Mary Astor plays Alberta Marlowe – a girl who is hiding some kind of secret. Astor was never a classic beauty, but as in The Maltese Falcon, she shared a chemistry with Bogart on screen, and that shows through here. Marlowe is on board because her father runs a plantation in Panama. Also on board is a portly gentleman named Dr. Lorenz. Lorenz is the villain of the piece and is played by Sydney Greenstreet. The character is similar to Caspar Gutman – his character from Falcon – both are deceitful, and manipulate the others characters for their own ends. If there is a weakness, Greenstreet is too likable and does not display enough menace too be particularly threatening. Don’t get me wrong, I love a good cultured villain, but when it comes time for Lorenz to turn nasty, it almost seems out of place. As the sea journey progresses, Leland befriends both Marlowe and Lorenz, and each of them learn of his bitterness towards the USA – the country that has rejected him. Leland’s attitude is of particular interest to Lorenz who is a spy for the Japanese. He figures he can use a disillusioned man like Leland to get information, and by the time the steamer reaches Panama, Lorenz puts his plan into effect. What is the plan? Lorenz is a front man for a Japanese plot to bomb the Panama Canal. Coe’s point of view is an interesting one, and it stacks up if you are only looking at the Bogart persona in films like The Maltese Falcon, Casablanca and To Have And Have Not. But if you are looking at it from an espionage point-of-view, and what he hints at, but fails to see, is that this film provided a template for some of the spy films that would later grace the silver screen. And furthermore, the comparisons with James Bond are completely unfounded as the film was made ten years before Fleming’s first Bond novel, and twenty years before the first EON film. I mentioned earlier that Across The Pacific evolved into a propaganda film. As such does it matter that it is jingoistic and maligns the Japanese? Well I guess in today’s world, I have to admit it is a bit heavy handed. But it is a film from a different time. The world was a different place, and America were just entering the war. I guess this is true whenever you watch any old film. Society has evolved, and our attitudes have changed, and watching some of the outdated politics from days gone by may be unsettling for some viewers. At the end of the day though, it’s just a movie – not a manual on how to live your life. So there you have it. That’s Across The Pacific. It may not be up there with the classic Bogart movies, but it is an enjoyable espionage thriller, and it’s an interesting deviation from the gangster and private eye roles that defined much of Bogart’s career.